For students of Anthropology, folklore, myth and magic, this is a remarkable document to finally see the light of day in an English edition. Thanks to the always innovative publishers at Anomalist Books for that. 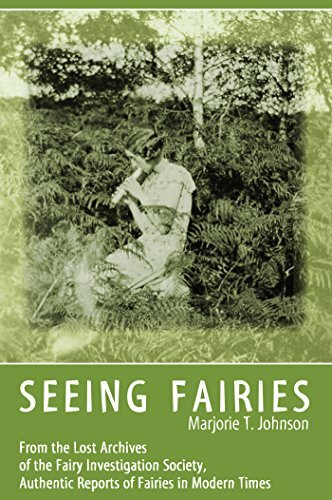 Marjorie T. Johnson became the Honorary Secretary for the Fairy Investigation Society in 1950, and began compiling one of the most exhaustive collections of anecdotal reports of encounters by a variety of people (adults and children) from around the English speaking world with the elemental/fairy/devic kingdom. Several aspects are near constants with these encounters, usually random, often interactive and frequently accompanied by a haunting musical strain in the environment. This musical aspect in these accounts was a feature of the phenomena I was not previously aware of. These reports are captivating and charming in their high strangeness, but at the same time smugly matter of fact in the reporting. The accounts by those who possess a predisposition to belief in these creatures, theosophists and Spiritualists among them, are among the least credible reports in the book. They smack of the maudlin and precious in their eagerness to validate a certain world view. The overwhelming number of anecdotes herein is not conducive to lengthy reading at a sitting, but rather savoring the stories in a leisurely manner releases their charm and nuance. For those wishing to build a decent beginning library on fortean fairy lore, this volume along with the seminal 'Fairy Faith in Celtic Countries' by W.Y. Evans-Wentz, Dermot MacManus' delightful 'Middle Kingdom: Faerie World of Ireland' and Janet Bord's 'Fairies: Real Encounters with Little People' makes for a solid foundation and hours of great reading. Highly recommended. I am slowly working my way through this and loving it. I have seen fairies and elementals all of my life. I am finding comfort in knowing I am not the only one, they are real and I think they appear to those of us that are sensitive to their energy. This is one of my favorite books, whenever I need uplifting or enchantment or a higher vibration, I just randomly open the book and something magical will reveal itself. so deep and beautiful and spellbinding. I treasure this book. The book is a series of individual stories from people who subscribed to a Theosophy magazine between 1900 and 1950 or so. They saw the other crowd, or claim they did. Stories mostly from Britain, a few from other places around the world but mostly from Britishers. The stories have differing levels of veracity, but the people writing in had different levels of writing skill, different beliefs, and different experiences so that makes sense. I think the book could have been organized differently but there seem to be several hundreds of stories. Quaint; the language and the place names and the many, many different depictions of quiet out of the way woods and forests and mountains reminds you of the world that once was.